Acacia paradoxa DC is a thorny shrub up to 4 m tall. Leaves dark green, narrow elliptic 3 cm long, prominent midveins and marginal veins. Bark cracked, brownish grey. Flowers yellow to bright yellow appearing from September to October. Seeds longitudinally, small fleshy structures called elaiosomes. 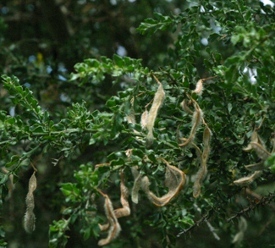 Pods brown, hairy and straight raised over seeds. Kangaroo thorn is native to Australia and is naturalised in the United States. 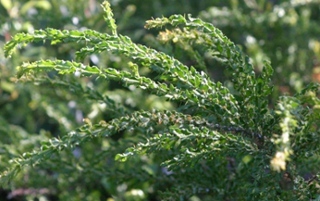 It is not clear how kangaroo thorn was introduced in South Africa, but the earliest record is of a specimen lodged in the Bolus Herbarium at the University of Cape Town in 1937. Kangaroo thorn invades exposed erosion slopes, valleys, pine plantations, agricultural lands and fynbos. The dense growth of kangaroo thorn may potentially reduce the abundance of native species. The seeds tolerate diverse environmental conditions and have the potential to colonise the land. The kangaroo thorn spreads via seeds, which are dispersed by ants. Currently there are no herbicides registered for kangaroo thorn in South Africa. It can be controlled by uprooting. Report sightings of these plants to the Invasive Species Programme at SANBI. We will need to know its locality (the size of infestation, supply a photograph, any landmarks or GPS information if possible).